Because the laws of mathematical probability and Information Theory force us to acknowledge that Life and its information content could not have evolved from “simpler” non-living processes, the least we can do is accept that they are axioms of the universe. H. P. Yockey’s conclusion is that all the information required to build the most complex organism on Earth was already built into DNA from the very beginning of Life. This is a proof from impossibility. That’s fine; but it would be nice to find other evidence of this pre-existing code. Time from the big bang to the present ~14-17 billion years. Within these galaxies only middle-aged stars of the mass of our Sun can support life – since after their first 100 million years they are the ones that burn at a nearly constant brightness and color. 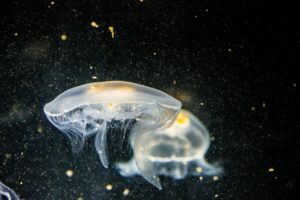 The question to answer is then: Is there proof that approximately 100 myr is enough time to evolve the animal phyla from jellyfish, and then use the remaining 400 myr for humanity? The answer is, No. There is no way to supply proof to answer this question because we cannot perform the experiment. We have no way of identifying what the selective pressures were that propelled evolution to get to where we are today. All arguments to the contrary are, really, circular reasoning. We are here today. And plenty of creatures that are not here today, existed at one time. Therefore – so goes the conventional argument from materialistic evolution – the selective pressures must have been there because there is no other scientifically plausible explanation. But as we discussed last time, that argument is untenable on two points. Random selective pressures cannot create information; therefore, that kind of “evolution” is out of the question. Second, it is obviated by the acceptance of the axiom of Life. Since the information was there already in DNA from the very beginning, we do not have to strain the mind inventing plausible explanations for why such and such a physiological structure appeared in the fossil record. It was already there as a potentiality! Something (or Someone) favored its expression. Though this position may be distasteful to strict Darwinians, there’s nothing that can be done about it. If Darwin had known about Information Theory, he himself may have caught the problem. In fact, he knew the problem was there when he admitted that it strained the mind to consider how an organ as complex as the human camera-type eye (or for that matter, the octopus’ eye) could have evolved by minute sequential steps from the simplest versions in invertebrates. He only accepted evolution as the answer because it was the only answer he was willing to accept. But we don’t have to. If the information for building a camera-eye was in the DNA, right alongside with the information to build eye-spots in starfish, then there is no need to evolve the former from the latter. The mystery is, how this information is packaged together to create a given organism? And we are far from solving that mystery. The genome of most vertebrates is composed of between 1 billion and 7 billion DNA base pairs (humans check in at 2.9 billion). Plasmodia are in the 25 million range and viruses in the tens of thousands range. But Amoeba have genomes in the 200 to 700 billion base pairs range. We know more now. But are we better off than Darwin? Now that it seems that the pre-existence of the information in DNA is the only mathematically tenable answer, can we find corroborative evidence elsewhere? In standard materialistic evolution, the appearance of a blind animal species in a dark environment (a cave) is taken as corroborative evidence of natural selection, under the assumption that “disuse” will allow regression or vanishing of certain traits. But since standard evolution is assumed to proceed by systematic sequential “minute” variations, how long would it take for a blind species to evolve so it can thrive in a cave? And if its caves were to be slowly eroded away, how long would it take for this regressed species to recover its eyes? Larger and more superficial neuromasts and larger cranial neuromasts. The size, shape and organization of the craniofacial bones particularly around the eye socket is different. Cavefish have also increased the size of their jaws, the number of oral and pharyngeal taste buds, and the number of maxillary teeth. All of these are obvious adaptations to be excellent swimmers and bottom feeders in a dark environment… But how do you get from A to B? The answer: Shh gene hyperactivity. The eye lens cells of the cavefish are preprogrammed to die, triggered by Shh. In early development of the embryo, the lens starts forming as in the surface fish but then, before differentiation starts, the cells die. Which causes the retina to die, which leads to a different brain structure and craniofacial structure that accommodates larger jaws. On which the same Shh overexpression leads to increased taste buds on the external surface of the lower jaw and sides of both jaws (for better feeding from the bottom in the dark). And, by the way, the Vibration Attraction Behavior is mediated by the superficial neuromasts that grow in the now eyeless orbit of the cavefish (and are absent from surface fish). And, of course, that different brain structure is needed to manage the extra neuromasts. (See, Yamamoto Y, Byerly MS, Jackman WR, Jeffery WR; “Pleiotropic functions of embryonic sonic hedgehog expression link jaw and taste bud amplification with eye loss during cavefish evolution”; Dev Biol. 2009 Jun 1;330(1):200-11. doi: 10.1016). This really sounds like an If-Then loop in a computer program. Actually, nested If-Then loops. It’s like you driving home and pushing the button of your garage door opener as you arrive: Not only does the garage door open, the house unlocks, the oven turns on, the refrigerator puts the casserole in the oven, and then sets the timer. Are these features permanent (irrevocable)? By that I mean, are they the culmination of a long train of necessary changes to guarantee the cave dwellers’ survival? If so, you would think it would take a similar long train of changes to restore sight to them. But, if you transplant an embryonic eye from a surface fish into a cavefish embryo, it develops and functions normally proving that the cavefish has all the genes necessary for downstream eye development. What we have here is quite a bargain: two fish for the price of one. Two complete computer programs that can lead to two physiologically and behaviorally different creatures, in the same package. DNA analysis from 1997 suggested that dogs evolved away from the gray wolf around 130,000 years ago. Domestic dogs were certainly around 12,000 years ago. So, how long does it take to evolve a domestic dog from a wolf? First capture a good population of wild foxes. What you get are foxes that have a longer window for bonding with humans, plus a reduced fear reaction that further enhances tameness. 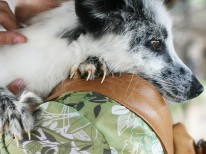 And you also get changes in the foxes’ coat color, including mottled coats and a loss of pigment in certain areas of the body, leading in some cases to a star-shaped pattern on the face, similar to that seen in some breeds of dog. Continue this selective breeding experiment and next come traits such as floppy ears and rolled tails, similar to those in some breeds of dog. 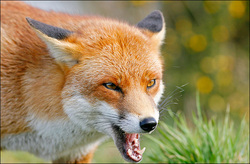 After 15 to 20 generations you get foxes with shorter tails and legs and with underbites or overbites. And they start vocalizing much like dogs. Allow themselves to be petted and held. Tail wags and curls up at the sight of humans. Barks and whines happy for attention. Rolls over on back and exposes stomach, a sign of instant submission. If these were random mutations that were accidentally selected by the environment or by ancient humans on purpose, to get dogs out of wolves, why are they found today in wild foxes? And they are ready to be “printed out” by selecting the one switch to throw: tameness. Apparently, the DNA language naturally leads to computer programs with the ability to “print out” viable variants of a species that are capable of surviving dramatic changes in the environment or of exhibiting completely different behavior, at the throw of a switch. This may be the primary purpose for Pleiotropy: the ability of one gene to enhance or suppress two or more seemingly unrelated phenotypic traits at the same time. The more we learn about life and the genetic code, the more James Clerk Maxwell’s comment comes to mind: We are witnessing something that has the unmistakable appearance of a manufactured article: made on purpose for a purpose.